New York à la Keiko: I took the plunge and got me a Clarisonic...Which kit would you have picked? I took the plunge and got me a Clarisonic...Which kit would you have picked? Sephora's Beauty Insiders special gets you 15% off your purchases (promo code: CHIC) now until April 21. So, I decided to finally get the uber popular Clarisonic facial scrub system thingy. I was not too familiar with the system but heard so many great reviews about it, so it was weird that I didn't get it already. I should be receiving it next week. I'll review it if it doesn't work out for me but if it works fabulously like everyone else reviewed it then silence is golden! What I had a hard time finding out is the difference between the different system available. Mia, Mia2 , Plus, Acne...and I know the systems are ultimately the same so I had to think about what I needed? What did I want out of this system? Better skin is one thing, removing dry patches, smoother skin, better absorption of my moisturizer, smoother make up application and also wanted to clean my neck and underarms better. It sounds like Clarisonic can do all that so why hesitate? Oh yes, the price! But it looks like 15% is better than nothing although other websites offer better discounts. I've seen the Clarisonic systems go for 20% off BUT the websites usually offer the old system and NO bundles or kits like Sephora does. I think it's worth getting all the freebies from Sephora and especially worth waiting for specials. Also, it had to be now so I can go through the "purge" phase sooner than later i.e. NOT on wedding day. Another big question I had was, can I use the Clarisonic with other cleansers I already have? I use Cetaphil in the morning and ProActiv cleanser at night and neither of them really makes bubbles. 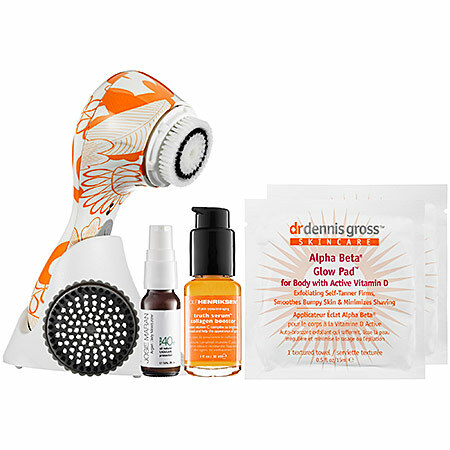 Will it be okay to use with the Clarisonic? or is the system only effective with the Clarisonic products? Looking at some sets that include cleaners from Boscia, I guess the answer would be no. 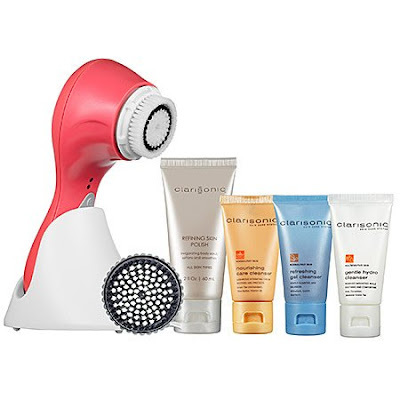 Which set would you have picked for your first ever purchase of a Clarisonic system? This, this or that? All at 15% off. All info can be found on Sephora. Picking between the Clarisonic PLUS systems which has a third speed for body cleaning! (the picture shows all the bottles but in the details, there were only two cleansers stated sooo I'm not sure what I will be getting). I would not be needing the flash bronzer so I didn't pick this one. I was contemplating this set because I actually use the Josie Maran moisturizer but the pattern is awful so that was the tipping point of not getting this set. I think the cleanser is personal preference. some ppl prefer ones that don't foam up. I have read a couple of blogs where they luv it with the shu cleansing oil. And I just passed by the shu counter, load and behold it's on the shu counter. I know I tried it with the shu foaming cleanser and its good. Thanks! I have tried samples of the Shu Uemura oil cleansers for removing my makeup but I always heard it gives little breakouts so I never really got full size cleansers...my sisters uses them and seem to have no problem. I just want to know that the brush will work for what I am using already!